work on a craft for hours and kerbal crashed making all your work for nothing ? used the undo hot key but it didn't do what you expected and now hard work is again for nothing ? want to have an older version of your craft but never saved it ? want to group up your crafts in the load menu ? want to sort the crafts? Well we got the answer for your troubles. Presenting CraftHistory. Saving your craft file after every change of the craft or periodically. 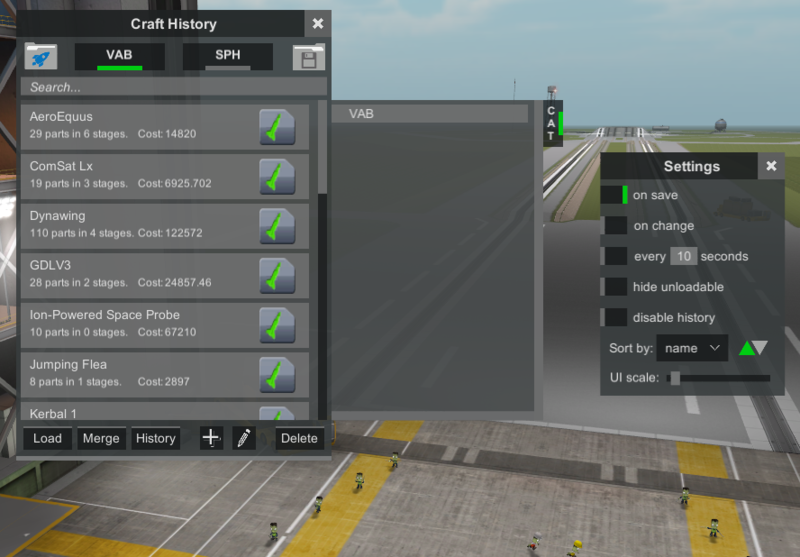 If you don't want your crafts to be saved and only want to use the categories feature of this mod you can simply disable it.